§ 401.030 Administration And Review Bodies. Section 401.030 Administration And Review Bodies. Title. These regulations shall be referred to as the "Parkville Development Code." References to "this code," "the Development Code," or "these regulations" shall be considered a reference to the Parkville Development Code, and references to "zoning ordinance" or "subdivision regulations" may be interpreted as references to specific parts of the Development Code. Authority And Jurisdiction. The Development Code is enacted pursuant to the authority granted in Chapter 89, RSMo., as amended, and applies to all structures and land within the incorporated area of the City of Parkville, as depicted on the Official Zoning Map, and other maps accompanying the City's plans and policies. It shall be unlawful to conduct any development or use of land until any applicable development review and processes have been followed, all applicable standards have been applied, and all applicable approvals, permits or other authorizations have been issued. Provide for coordinated development of Parkville consistent with established policies of the City. If any court of competent and final jurisdiction declares any part of this Development Code to be invalid, that ruling shall not affect any other provisions of this Development Code not specifically included in that ruling. If any court of competent and final jurisdiction declares that the application of this Development Code to a particular property or structure is invalid, that ruling shall not affect the application of the regulations to any other property or structure, or projects with different circumstances. No provision of this code shall enable any circumstance which is unlawful under superseding Federal or State law. If any section, subsection, sentence, clause, phrase, or portion of this code is now or in the future superseded or preempted by State or Federal law or found by a court of competent jurisdiction to be unauthorized, such provision shall be automatically interpreted and applied as required by law. All words shall have the customary dictionary meaning, unless specifically defined in these regulations. The present tense includes the future tense and the future tense includes the present tense. Lists of examples prefaced by "including the following," "such as," or other similar clauses shall not be construed as exclusive or exhaustive and shall not preclude an interpretation of these lists including other similar and non-mentioned examples. "Shall" or "must" is mandatory; "should" or "may" is permissive, but recommended as a way to best meet the standard or achieve the intent of the standard. A reference to an administrative official shall refer to that official or his or her official designee, and all references to specific City officials may also include any other designee of the City Administrator. Any reference to other official local, state or federal government rules or regulations shall include the current versions of those regulations, provided that they remain binding or are consistent with the purposes, intent, and objectives included in these regulations. References to a person shall include individuals, partnerships, agencies, corporations or other legal entities. Conflicts. In case of a conflict between these regulations and any other adopted regulation of the City, the more restrictive standard shall apply. In making a determination of which standard is more restrictive, the official may consider which is more specific; which is more consistent with the Master Plan; which is more consistent with the purposes, intent and objectives of these regulations; and which best promotes the public health, safety and welfare. General Calculations. When calculations result in fractions, it shall be rounded up to the nearest whole number if the standard is expressed as a minimum requirement, and rounded down to the nearest whole number if the standard is expressed as maximum allowance. Building coverage: the percentage of the total area of the lot covered by buildings or roofed areas of principal and accessory buildings, measured along the wall at ground level, excluding the first four (4) feet of any unenclosed roof overhangs. Building coverage may control the scale, mass or orientation of the building more than is established within the setback lines. It does not include any unroofed projections, surface parking, or uncovered patios, stoops or plazas. Non-residential and residential buildings are depicting the measurement of building height from the average grade at the front building line to the top of the roof. Story heights are also illustrated demonstrating the typical story heights of stories depending on their use. Building Height. Building height, when expressed as a dimension, is measured from the average grade to highest point of a roof. Average grade is determined by calculating the average of the highest and lowest elevation of pre-development grade along the front building line parallel to the street. Where significant development is proposed in association with a grading plan, post-development grades may be used subject to a grading plan approved with development review. Building heights expressed in both dimension and stories shall use the additional story limits to impact the scale, form, and mass of the building within the permitted overall height. Building setbacks: the minimum required distance between any lot line and the building. When front building setbacks are expressed as a range [i.e., ten (10) feet to twenty-five (25) feet], it shall be interpreted as a build-to range within which distance the front building line of the principal structure shall be established. Story: the part of a building included between the surface of one floor and the surface of the floor next above, or if there is no floor above, that part of the building which is above the surface of a floor and the ceiling next above. Story heights shall be eight (8) feet to twelve (12) feet, generally. The first story for residential buildings should be nine (9) feet to fourteen (14) feet. The first story in non-residential buildings should be twelve (12) feet to twenty (20) feet. Any story that has less than four (4) feet of its height exposed above finished grade on the front elevation, or which has more than fifty percent (50%) of its perimeter wall area measured from the finished floor elevation surrounded by finished grade shall not count as a story for the purpose of measuring building height. Story, half: the space under a sloping roof that has a line of intersection of the roof and wall face not more than two (2) feet above the floor level and in which the possible floor area with head room of five (5) feet or more is greater than forty percent (40%) of the total floor area of the story directly beneath. Lot area: the minimum required area of a horizontal plane bounded by the vertical planes through front, rear and side lot lines or, when expressed as a range, it shall be interpreted as a minimum and a maximum. Lot depth: the horizontal distance between the front and rear lot lines measured at right angles to the front right-of-way lines. Where the front and rear lines are not approximately parallel, the lot depth shall be the average when measured from at least three (3) different points along the front lot line, including the two (2) corners at the front lot line. The portion of the lot that establishes the relationship between the building and other site elements and the public realm or street upon which the lot fronts. When expressed as a linear dimension, the horizontal distance between side lot lines, measured at the front lot line. Where the front lot line abuts a curved right-of-way, the lot frontage requirement may be applied at the front building line for purposes of regulating the dimensions of lots. When expressed as a percentage, the maximum percentage of that frontage width applied to the entire depth of the frontage area. Lot width: the horizontal distance between the side lot lines, typically measured at the front lot line, but for irregular lots it may be measured at the front building line. Corner lots are unique in that they are able to front on two (2) different streets or in some cases both. The figure illustrates the different options for the property owner to face his or her building and how this effects the setbacks used. Standard Corner. The building orients to the front of all other buildings fronting on the same street, and an expanded street-side setback may apply. Side and rear setbacks apply to the remaining sides. Reverse Corner. The building orients to the end-grain of the block, and the front setback and frontage design applies to that side, and the street-side setback can be the greater of a) the stated street-side setback for that building type or b) ten (10) feet in front of the forward most point of the front building line of the abutting lot. Side and rear setbacks apply to the remaining sides. Corner Orientation. The building orients to both streets, with the front setback and frontage design applying on both street sides. The two (2) remaining sides are treated as side setbacks and there is no rear setback. Signs are measured based upon the basic shape types or a combination or multiple shapes. Displayed are examples of how a sign is measured and real examples of signs and how they could be measured. General Area Calculation. Signs mounted on or displayed as a standard geometrical shape shall be measured by the standard mathematical formula for that shape. 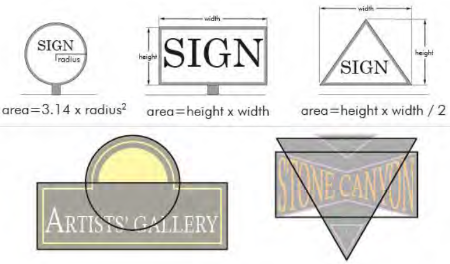 Signs mounted on or displayed as an irregular shape shall be measured by the smallest area of up to two (2) standard geometrical shapes that can encompass the entire sign mounting. Detached Signs. The area of the sign shall be computed by the entire area of the face of the structure, cabinet or module enclosed by the border of the frame. Building-mounted signs can be measured as one (1) sign or two (2) depending on the distance between the two (2). If the sign distance exceeds two (2) times the height of the sign it is measured at two (2) signs. Wall, Window Or Other Building-Mounted Signs. Any building-mounted sign mounted on a background shall be measured by the area of the background. If mounted directly on the wall, the area shall be computed by means of the smallest single and continuous perimeter of up to two (2) standard geometric shapes that enclose the outer limits of the writing, emblem or other display. Gaps in writing, emblems or other display which are greater than two (2) times the height of the sign area, when using the same single continuous perimeter above, may be subtracted from the calculation of the sign area but shall be interpreted as two (2) signs. The area of the wall or window area for the purposes of determining an allowed percentage shall be the total surface of the wall or window visible in an elevation view. Signs that have two (2) facing sides have the potential to be recognized as two (2) separate signs. The figure illustrates that if a gap between the two (2) faces exceeds three (3) feet, then it is considered two (2) signs. Double-Faced Signs. Where the sign faces of a double-faced sign are no more than three (3) feet apart at any location, only one (1) face will be measured in computing sign area. If the two (2) faces of a double-faced sign are of unequal area, the area of the sign will be the area of the larger face. In all other cases, the areas of all faces of a multifaced sign or the surface area of objects will be added together to compute the area of the sign. The day of the act that commences a time period shall not be counted. The last day of the time period shall be included, unless it is a Saturday, Sunday or legal City holiday, in which case the next working day shall end the time period. Whenever any time period is expressed for a formal submittal to the City, the time period shall end at 4:00 P.M. on the last day of that time period. Any time period expressed in years shall include a full calendar year from the act that commences the time period. Where boundaries are indicated to approximately follow streets or other rights-of-way or water bodies, the center lines or extension of these center lines shall be the boundaries. Where the district boundaries are indicated as approximately following property lines, the platted or other official legal line of that property shall be the boundary, unless the property boundaries on the map have been substantially altered. Where the district boundaries split any platted lots, the lot shall be interpreted in the district designated to the majority of the lot. Where the district boundaries split any unplatted property, any future platting of property may generally follow the zoning boundary and then each resulting property may assume the zoning applicable to the majority of the resulting lot, or where any resulting lots have significant discrepancies with zoning boundaries, rezoning may be required. Non-Regulatory Provisions. Intent statements, graphics and commentary, such as captions to graphics or notes in tables, are an aid to interpretation of the standards. In the event of any a conflict or ambiguity between the intent statements, graphics or commentary and a specific standard, the specific standard shall control. Resources, Guides And Industry Standards. Resources, guides and industry standards that are recognized as reputable authority in the planning, development and urban design professions may be used to supplement interpretation of this code. They shall be subject to the approval of the Director upon a determination that the content is consistent with the policies of the Master Plan and the purposes, intent, and design objectives of these regulations. Any resource, guide, or industry standard approved by the Director shall be listed in Appendix A and at least one (1) copy shall be kept on file with the Community Development Department. Use of these guides shall only be to the extent that it is consistent with the purposes, intent and design objectives expressed in these regulations, and shall not be used to otherwise modify, contradict or in any way conflict with any specific standard in these regulations. Editor's Note: Appendix A is included as an attachment to this Title. Staff. The following City staff positions are responsible for administering specific aspects of this code. Community Development Director. The Community Development Director (Director) is responsible for administration of the Development Code and is the principal interpretation and enforcement official of these regulations. The Director may consult with any other department or relevant outside agencies in order to coordinate their plans, policies and programs that impact the Master Plan. The Director shall make all final interpretation decisions and any final administrative decisions referred to the Director under the procedures and standards of these regulations. Director Of Public Works. The Director of Public Works shall be responsible for regulating and reviewing the engineering design, construction, operation and maintenance of all public improvements specified under these regulations. The Director of Public Works shall advise the Community Development Director on any technical specifications and engineering designs that impact implementation of the Master Plan and may make any final administrative decisions referred to the Director of Public Works under the procedures and standards of these regulations. Planning Commission. The Planning Commission is the appointed body of the City responsible for all long-range and comprehensive planning, as well as review, recommendations and decisions on implementation of the Master Plan. In addition to other general planning authority by statute, local ordinance, or bylaws, the Planning Commission shall have the specific review responsibilities and final administrative decisions referred to the Planning Commission under the procedures and standards of these regulations. Board Of Aldermen. The Board of Aldermen is the elected body of the City responsible for all legislative decisions that affect implementation of the Master Plan. In addition to other general authority authorized by law, the Board of Aldermen shall have the appeal authority and final decision authority referred to the Board of Aldermen under the procedures and standards of these regulations. Board Of Zoning Adjustment. The Board of Zoning Adjustment for the City of Parkville was created under the provisions of Chapter 89, RSMo. The Board is hereby continued with the following provisions. Membership. The Board of Zoning Adjustment shall consist of five (5) members who shall be residents of the City. Three (3) alternate members shall be appointed to serve in the absence, abstention or the disqualification of the regular members. Members and alternates shall be appointed by the Mayor and approved by the Board of Aldermen in accordance with the provisions of Chapter 110, Section 110.040, and Chapter 152. All members and alternates shall serve without compensation. Each Board of Zoning Adjustment member shall be appointed for a five-year term. Terms shall be staggered in accordance with Section 89.080, RSMo. Each alternate shall serve for a term designated by the Board of Aldermen. There shall be no limit to the number of terms that may be served. Vacancies shall be filled by appointment by the Mayor with approval by the Board of Aldermen for the unexpired term. Any member may be removed by the Board of Aldermen for cause stated in writing and after a public hearing. Officers. The Board of Zoning Adjustment shall elect a Chairperson, Vice Chairperson and Secretary from among its citizen members. The term of the Chairperson, Vice Chairperson and Secretary shall be for one (1) year with eligibility for reelection. Unless otherwise absent or disqualified, the Chairperson shall preside over all meetings of the Board of Zoning Adjustment. In the absence or disqualification of the Chairperson, the Vice Chairperson shall preside. In the absence or disqualification of both the Chairperson and Vice Chairperson, the Secretary shall preside. Quorum. Attendance by a quorum of three (3) Board of Zoning Adjustment members or alternates shall be required for a meeting to be held. Meetings. The Board of Zoning Adjustment shall hold regular meetings and special meetings, as necessary. Regular meetings shall be held on a regularly scheduled date as adopted by the Board of Zoning Adjustment. Additional meetings may be held at the call of the Chairperson and at such other times as the Board may deem appropriate. Any meeting of the Board of Zoning Adjustment may be omitted, if in the sole discretion of the Chairperson there are too few items on the agenda to justify the expense of holding the meeting. Any meeting of the Board of Zoning Adjustment may be rescheduled, as may be necessary. Rules And Bylaws. The Board of Zoning Adjustment shall adopt rules and bylaws in accordance with the provisions of any ordinance adopted pursuant to Sections 89.010 to 89.140, RSMo. Records. The Board of Zoning Adjustment shall keep a record of its proceedings in accordance with Chapter 610, RSMo., and the following. At a minimum, the Board shall keep minutes of its proceedings, which shall show the vote of each member upon questions, or, if absent or failing to vote, indicating this fact, and shall keep records of its examinations and other official actions, all of which shall be immediately filed in the office of the City Clerk, and shall be a public record. All testimony, objections, and rulings shall be taken down by a reporter employed by the Board for that purpose. To hear and decide appeals where it is alleged there is error in any order, requirement, decision, or determination made by an administrative official in the enforcement of this code. To hear and decide special exceptions to the terms of the Development Code where specifically stated and authorized. To authorize upon appeal in specific cases a variance from the terms of this code. Violations. It shall be unlawful for any building, structure, site element or use of land to be constructed, altered, maintained, or otherwise initiated in violation of these regulations. It shall be the duty of the Director, all officers and employees of the City, and of all members of the Police Department to assist the Director by reporting any seeming violation. Enforcement. The City may investigate and initiate proper actions or proceedings to prevent or terminate any activity or condition that is in violation of these regulations, including revoke or withhold any permits, prevent the sale or lease of property, correct or abate the nuisance, withhold any public improvements, or penalize and initiate legal proceedings to prevent the continuance of unlawful actions or conditions. Upon presentation of proper credentials, the Director may enter at reasonable times any building, structure, or premises in the City or perform any duty imposed upon him by these regulations. If the owner or occupant shall refuse to allow entry to the Director, the Director may apply to a court of competent jurisdiction for a search warrant or take any legal action necessary for the purpose of securing entry. Penalty. Any person violating any of the provisions of this code shall be guilty of a misdemeanor, each day constituting a separate offense, and any owner or other person employed in connection with a violation shall be guilty of a separate offense. Each offense shall be punished by a fine established by the Board of Aldermen by resolution in the Schedule of Fees. The City of Parkville shall further have the right to maintain suits or actions in any court of competent jurisdiction for the purposes of enforcing these regulations and to abate any potential nuisance. In addition to all other remedies provided by law, injunctions, mandamus or other appropriate actions may be instituted to prevent or remedy violations, including revocation of any permit authorized under this code. Intent. The general policy of the City is to allow uses, buildings and lots that were created legally and in conformance with then-applicable requirements, but that do not conform to the current applicable requirements of these regulations to continue. However, it is also the policy of the City to bring such uses, buildings and lots into conformance with current regulations as is reasonably practical. The intent of this Section is to balance the interests of property owners in past investments, discourage investment that expands or reinforces non-conforming situations, and promote investment consistent with the Master Plan and these regulations. The use may not be expanded beyond any specific area of the site or lot, but may be expanded within any existing building, provided that no structural changes are needed. Any new activity that triggers specific site design standards shall require full compliance of the site design standards in order for the non-conforming use to continue. A use that is discontinued for one (1) year or more shall lose its non-conforming status, and all future use of the site or building shall comply with these regulations. Any change of use shall be to a conforming use. Rehabilitation or expansion of the structure that increases the degree of non-conformity is prohibited. Other rehabilitation or expansions may occur, provided that they comply with all other requirements of this code, are not detrimental to the purposes, intent and objectives of the standards, and do not negatively impact development in conformance with this code on adjacent property. If destroyed by fire, natural disaster, accident, or any other cause by less than fifty percent (50%) of its fair market value, the structure may be restored to its original condition if the restoration is started within one (1) year. If destroyed by fifty percent (50%) or more of the fair market value, or if not restored within one (1) year, then the right to maintain the non-conformance shall terminate. If the structure is determined obsolete or substandard by virtue of any applicable code beyond this Title, and the cost of improvement or restoration is fifty percent (50%) or more of the fair market value of the structure, then the right to maintain the non-conformance shall terminate. Any change of use or expansion of use shall require compliance with the new standards up to the proportion that is required by the change. Any site development activity on a portion of a site shall require compliance with the new standards up to that proportion that is subject to the development activity. Where any investment is greater than fifty percent (50%) of the fair market value of the site, or can reasonably be interpreted as impacting more than fifty percent (50%) of any one component of the site, the site or that component shall be brought into full compliance with these standards. To promote infill development or adaptive reuse of existing sites and buildings, administrative adjustment procedures in Chapter 403 may account for non-conforming site conditions. Non-Conforming Lots. Any lots platted legally prior to the adoption or amendment of this code, but which could not be platted under the current requirements of this code may continue to exist, provided that they comply with all other applicable standards. Any difficulties meeting these standards caused by the non-conformance of the lot may be used as criteria in granting any discretionary relief to these standards. Non-Conforming Signs. Existing signs which were lawful at the time, but made non-conforming by adoption or amendment to this code, shall be legal, provided that they are maintained in good condition. Nothing in this code shall prohibit the ordinary maintenance repair of a non-conforming sign or replacement of a broken part of a non-conforming sign. Replacement of copy, content or message may be considered ordinary maintenance. Continued if a substantial part of the property or building is redeveloped, including more than twenty-five percent (25%) of the property or building by area or by fair market value. Non-conforming signs that are destroyed or damaged by fifty percent (50%) or more of the signs' fair market value shall not be rebuilt or repaired except in conformance with this code. Burden Of Proof. The burden shall be on the applicant to establish entitlement to continuation of non-conforming situations or completion of non-conforming projects, which shall be a question of fact decided by the Board of Adjustment.